I am joining Mary at Little Red House for Mosaic Monday.. 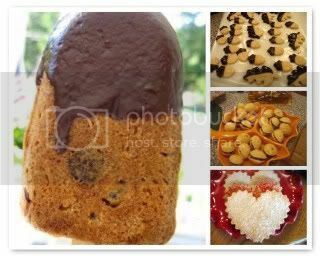 Please visit her lovely blog for the other entries..
Chocolate dipped chocolate chip cookie on a stick...rolled cookies cut with a leaf cutter dipped in chocolate, heart shaped sugar cookies, and cookies filled with chocolate made in molds shaped like nuts..
Hope you will join in, it was lots of fun last time!! Oh, you had to. You just had to. Cookies. Gorgeous, delicious looking cookies . . . Aaarrgghhh!!!! Hi Kathleen! Thanks for the visit and comment -- nice to meet a fellow Long Islander! Happy Mosaic Monday! Your cookie mosaic is yummy! Are thsoe Milan cookies in the upper right from the daring Baker challenge we did recently? Thansk gooness I am not allergic to fish! I love it in all forms. Finally a mosaic I can sink my teeth into. Yum. I don't eat shellfish, I don't cook shellfish and I don't even wash a pot or pan that has cooked shellfish. I'm not allergic so a benydryl won't help. It just makes me gag. Now if you slip some salmon or some halibut in the mix I'll be there. Nothing better than cookies in my opinion! I'm glad you were inspired :-) I'm there for shellfish too! I really like all your cookies but the popsicle ones are so fun for summer. The gkids must have loved them! :0) Love the shellfish warning!! I'm always happy to see a food mosaic! A cookie on a stick dipped in chocolate! How great is that. Happy day and week to you! Now this is my kind of mosaic!! They are all so pretty. The cookies that look like nuts look difficult to make. I often look at the food and sweets you have on your sidebar and tell myself to come back for the recipe...you should have your own cookbook. AND, use your own tablescapes! Those cookies sure do look yummy! Yummy...love the molds shaped like nuts..is it a plastic mold? Delicious! I'll take one of each if you don't mind. And the idea of a chocolate chip cookie on a stick is too much. 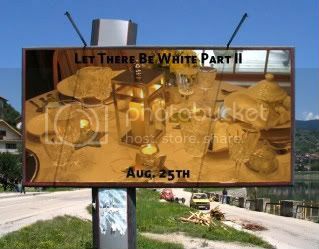 Kathleen, I love white, so it'll be next to impossible for me to stay away from Let There Be White II. The cookies look delicious! I'm taking your button for my sidebar. I'll see what I can come up with. Nothing much better than a cookie mosaic except for the real thing. I'd be happy to eat any cookie that you made, Kathleen. ... But the nuts cookies really do look intriguing. Yummy mosaic! Looking forward to the white event Kathleen.